10-12-2015 - We did it!!!!!! 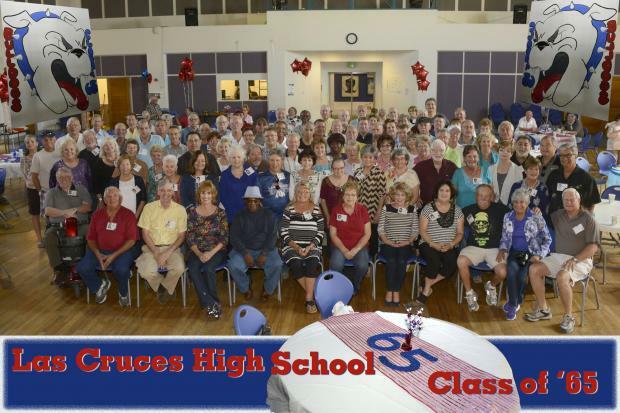 The LCHS Reunion celebrating 50 years since our graduation took place on October 9th with a mixer at La Posta de Mesilla where 195 classmates and their spouses gathered to meet, greet and happily begin catching up with each other. The mixer was followed Saturday morning beginning at 9:30 am at the Las Cruces Veterans Memorial Park with a solemn Memorial Ceremony honoring our classmates who lost their lives in the Vietnam War. The Saturday afternoon tour of LCHS began at 1:30 pm and was lead by various members of the LCHS National Honor Society. Saturday evening we squeezed into the Picacho Hills Country Club for a superb view of the beautiful Organ Mountains as the sun set and lights of the city began to glow. We enjoyed having another opportunity to visit with friends or move to the music of 'Remember When' in another part of the facility. The Reunion concluded at what we all knew as Court Junior High School, now known as Alma d'Arte, a charter high school for the arts. We met at 10:00 am and again enjoyed an opportunity to continue our conversations with friends while a group of women from our class, who lovingly refer to themselves as the 'Blue Hairs,' served a delicious brunch. While we enjoyed the food, classmate Jeff Moore, professional musician, played his guitar and sang for us. Our time together at this reunion drew to a close about 1:00 pm as we bid each other our fondest farewells till the next reunion. Let us know what you thought about the reunion by leaving your comments in the Guestbook portion of this web site.